It’s perfectly fine to use the lens of history to look at pop culture. Perhaps it isn’t the most useful thing to do, but it’s fun and can’t hurt anybody. How did the Beatles prefigure Justin Bieber? What would Harry Potter would be like if he had been a character in a Dickens novel? Are modern films more indebted to Hitchcock or Spielberg? All interesting questions, if perhaps somewhat inconsequential. 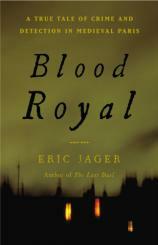 What Eric Jager does in BLOOD ROYAL is the opposite of that: using pop culture as a lens to look at medieval France. Specifically, Jager (at least in the first half of his book) is taking a minor French knight named Guillaume de Tignonville and putting him in the role of the modern-day detective. In a modern society that tends to sneer at martial valor and openly mocks moral qualities, the character of the detective is one of the few fictional touchstones left. We’re in the middle of a revival of all things Sherlock Holmes, the original “consulting detective.” Batman isn’t just a superhero, he’s the world’s greatest detective to boot. The Internet Movie Database lists over 3,700 movies and television shows that feature a detective (which includes everything from The Silence of the Lambs to “Police Squad!”). Detectives in modern fiction tend to be smart, determined, hard-working, and single-minded in their pursuit of justice --- all characteristics that align very well with modern values. "BLOOD ROYAL is a great work of history and a crackling good read, made all the better if you aren’t as familiar with French medieval history as maybe you ought to be." Guillaume de Tignonville was a medieval man in a modern context. In the early 15th century, he was the provost of Paris, responsible for investigating crimes, trying the accused and punishing the guilty. (Jager explains in great detail how the guilty got punished at the time, and it’s every bit as grisly as you’d imagine.) It was a position that made de Tignonville very powerful and feared, but also quite vulnerable, meriting a squad of bodyguards known as The Twelve (an undeniably cool name). de Tignonville might have fallen into obscurity were it not for the vile murder of Louis of Orleans, which happened in Paris in 1407. Louis of Orleans was the brother of the king, and since this particular king was known to history as Charles the Mad, he was effectively the regent of the realm as well. Louis was out late, wandering the streets of Paris one evening and riding on a mule, when a band of ruffians overtook him, scattered his followers and beat him to death. The primary similarity between this crime and the ones that fictional detectives typically face was the multiplicity of suspects. Louis was widely hated by any of number of people, including but not limited to those he taxed (to support his lavish lifestyle) and those he cuckolded. de Tignonville took immediate charge of the investigation, questioned the witnesses, canvassed the neighborhood, and generally did what a detective would do. In a plot twist that reads like something out of an Agatha Christie novel, de Tignonville even gathers the likely suspects and asks them to submit to a search of their premises. That was a decision with significant consequences, not only for de Tignonville but also for generations of Frenchmen. BLOOD ROYAL is best read as a pulpy, ripped-from-the-headlines murder mystery, with the spice and intrigue you only get from something true to life. Without giving away too much of the ending, it is discovered that the assassins were in the pay of a prominent French nobleman, who in turn unleashes a chain of events that results in an unbelievable trial, a civil war and decades of strife. This is a detective story, but doesn’t end the way you’d expect a detective story to end. Jager painstakingly explains what happened to de Tignonville as a direct result of his efforts, and it’s horrifying even by medieval standards. Not only is virtue unrewarded, not only does justice not prevail, but personal and civic disasters erupt. In a sense, BLOOD ROYAL is like a “Law & Order” episode where Lennie Briscoe accidentally sets off a literal war between Manhattan and Brooklyn, with New Jersey getting to invade Staten Island in the process. BLOOD ROYAL is a great work of history and a crackling good read, made all the better if you aren’t as familiar with French medieval history as maybe you ought to be. Its source material is largely drawn from the interrogations of the witnesses at the scene of the assassination, which were preserved in secret and uncovered hundreds of years later. Its only flaw is that, sadly, history can never be contained in something as neat and tidy as a 60-minute television melodrama, and instead is known for mind-boggling twists. The book ends with a brief retelling of the story of the Maid of Orleans --- just the sort of real-life plot twist that any good writer of detective fiction would never stoop to honor.